The topics in this section provide information about the recurrence concept of the igScheduler control. The activity recurrence is used when you need to have repetitions of an activity following a specific recurrence pattern (for example each day at a specific hour or each month at a specific date). 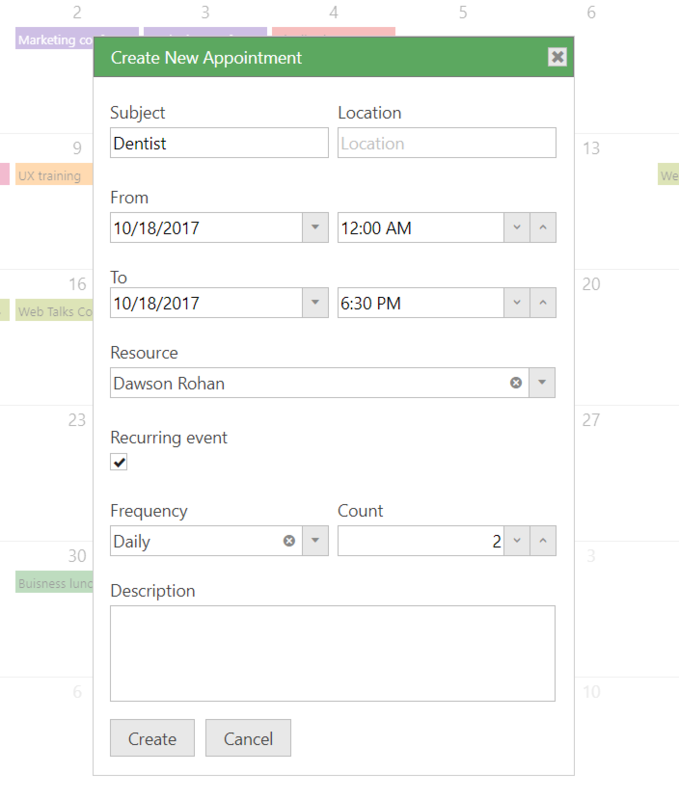 Select the day for your activity (from the scheduler month view for example) and choose Create appointment button after the notifier shows up. Fill in the required fields from Create New Appointment dialog that will be used for the new appointment instance. Check Recurring event checkbox and set Frequency and Count. isRecurrenceRoot A boolean property indicating if the activity is a recurrence root activity..
recurrenceRoot Returns the root recurrence activity or null if the activity is not associated with a recurrence. recurrenceId Returns the ID of the root recurrence activity or null if the activity is not associated with a recurrence. Configuring Appointments (igScheduler) This topic shows how to setup and configure Appointments DataSource for the igScheduler.